Castleford Tigers have had plenty to celebrate in home games so far this season. Castleford Tigers boss Daryl Powell believes his side can take confidence from their home form ahead of today’s eagerly anticipated local derby against the Super League leaders. 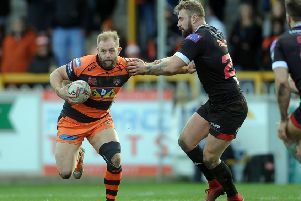 Leeds Rhinos are in town for a game that is set to bring another bumper crowd to the Mend-A-Hose Jungle as Tigers get their first chance of revenge against the side that beat them in last year’s Challenge Cup final. It will be a match between two of the form teams with the Rhinos having won six of their seven so far and Cas successful in their last three home games – and will be played out in a packed stadium. “It will be buzzing again, no question, absolutely,” Powell told the Express. “It will be absolutely packed from what the guys at the club are telling me. “There’s been some great atmospheres already this season and I think this will better them all. “It’s important for us that we have chalked a few wins off and have started to find that consistency we’ve been talking about. “This is a good opportunity to really rubber stamp a bit of consistency about us and we know we have to be right on top of our game. “I’ll pick a team to get the job done and the boys will need to be 100 per cent, every single one of them. Powell is pleased with the way the Tigers have shaped up in home games. He said: “The fans will see it as a chance for revenge after the cup final, but it’s a new season, a new team and we want to continue our good home form. “Apart from the end of the Wakefield game we’ve been pretty good and tough to beat at home and we want to make ourselves a really tough team again this week, try to execute our game plan and put these boys under some pressure. “If we can do that we’ve got to have some confidence about us.